We are always delighted when one of our weddings gets featured in a wedding magazine. 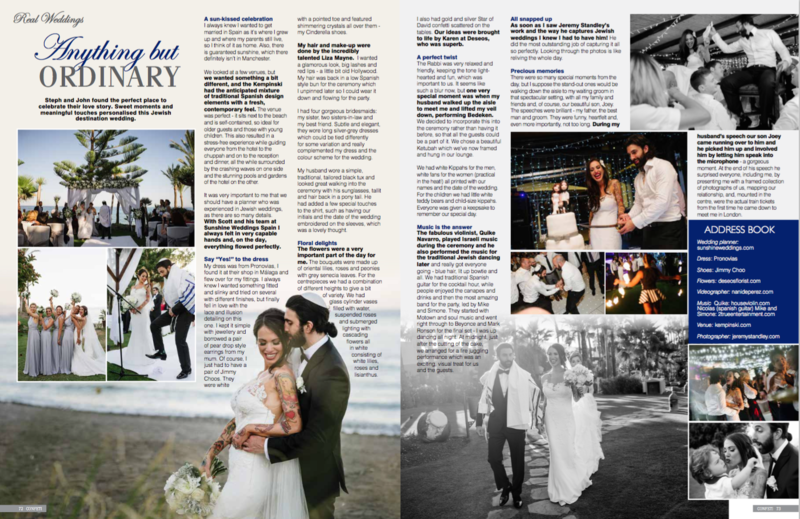 In the Winter issue of Confetti Steph and Johns Jewish wedding in Estepona Spain was given a double page spread. Here is there story. Steph and John found the perfect place to celebrate their love story. Sweet moments and meaningful touches personalised this Jewish destination wedding. I always knew I wanted to get married in Spain as it’s where I grew up and where my parents still live, so I think of it as home. Also, there is guaranteed sunshine, which there definitely isn’t in Manchester. We looked at a few venues, but we wanted something a bit different, and the five star beach hotel in Estepona had the anticipated mixture of traditional Spanish design elements with a fresh, contemporary feel. The venue was perfect – it sits next to the beach and is self-contained, so ideal for older guests and those with young children. 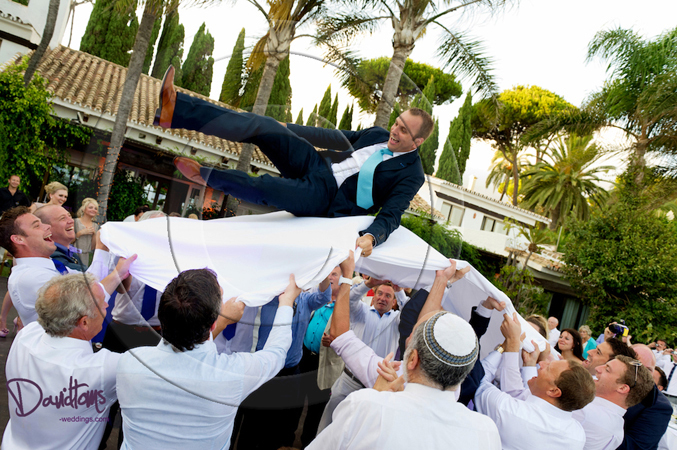 This also resulted in a stress-free experience while guiding everyone from the hotel to the chuppah and on to the reception and dinner, all the while surrounded by the crashing waves on one side and the stunning pools and gardens of the hotel on the other. It was very important to me that we should have a planner who was experienced in Jewish weddings, as there are so many details. With Scott and his team at Sunshine Weddings Spain I always felt in very capable hands and, on the day, everything flowed perfectly. My dress was from Pronovias, I found it at their shop in Málaga and flew over for my fittings. I always knew I wanted something fitted and slinky and tried on several with different finishes, but finally fell in love with the lace and illusion detailing on this one. I kept it simple with jewellery and borrowed a pair of pear drop style earrings from my mum. Of course, I just had to have a pair of Jimmy Choos. They were white with a pointed toe and featured shimmering crystals all over them – my Cinderella shoes. My hair and make-up were done by the incredibly talented Liza Mayne. I wanted a glamorous look, big lashes and red lips – a little bit old Hollywood. My hair was back in a low Spanish style bun for the ceremony which I unpinned later so I could wear it down and flowing for the party. I had four gorgeous bridesmaids: my sister, two sisters-in-law and my best friend. Subtle and elegant, they wore long silver-grey dresses which could be tied differently for some variation and really complemented my dress and the colour scheme for the wedding. 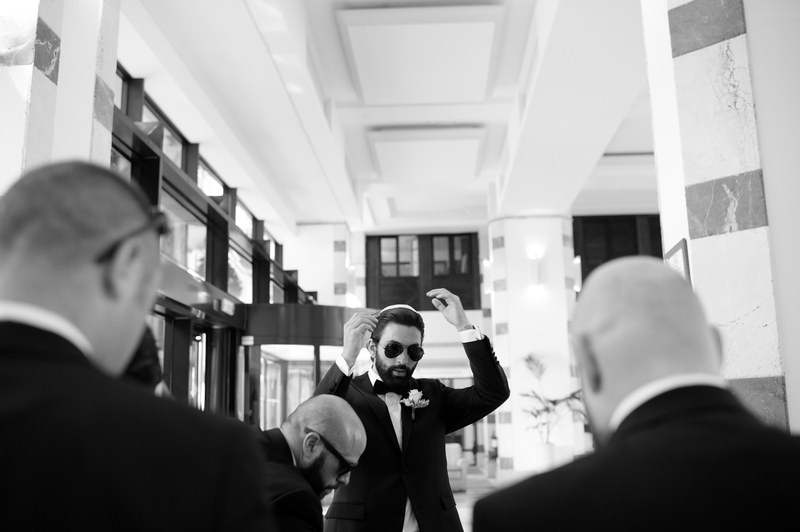 My husband wore a simple, traditional, tailored black tux and looked great walking into the ceremony with his sunglasses, tallit and hair back in a pony tail. He had added a few special touches to the shirt, such as having our initials and the date of the wedding embroidered on the sleeves, which was a lovely thought. The flowers were a very important part of the day for me. The bouquets were made up of oriental lilies, roses and peonies with grey senecia leaves. For the centrepieces we had a combination of different heights to give a bit of variety. We had glass cylinder vases filled with water, suspended roses and submerged lighting with cascading flowers all in white consisting of white lilies, roses and lisianthus. I also had gold and silver Star of David confetti scattered on the tables. Our ideas were brought to life by Karen at Deseos, who was superb. The Rabbi was very relaxed and friendly, keeping the tone light-hearted and fun, which was important to us. It seems like such a blur now, but one very special moment was when my husband walked up the aisle to meet me and lifted my veil down, performing Bedeken. We decided to incorporate this into the ceremony rather than having it before, so that all the guests could be a part of it. We chose a beautiful Ketubah which we’ve now framed and hung in our lounge. We had white Kippahs for the men, white fans for the women (practical in the heat!) all printed with our names and the date of the wedding. For the children we had little white teddy bears and child-size kippahs. Everyone was given a keepsake to remember our special day.